For a long time, Ricky Steele has been doing things with his fists and feet that would immediately earn him membership in the “cool dad” club. But it wasn’t until he returned home to Idaho after taping The Ultimate Fighter: Undefeated in Las Vegas that he got his official membership card. That fight game is one in which there’s more than meets the eye in Steele’s 5-0 MMA record. And it’s not all good. A martial artist for much of his 29 years, earning the nickname “The Karate Kid” for his striking acumen, Steele ultimately turned to MMA, turning pro in 2013. But in the subsequent five years, he’s only managed five fights due to injury, with a knee injury the winter before TUF tryouts making him wonder whether this was going to be a path he continued on. Then came the hard part, which was leaving his daughter and his business behind for six weeks to chase his dream. Tonight, TUF viewers will get their first look at Steele when he fights Suman Mokhtarian in a quarterfinal matchup. If he wins, another victory puts him in the season finale in July. That’s the place Steele has always wanted to be in ever since he stepped into the gym in 2010 to find Scott Jorgensen preparing for his WEC / UFC title fight against Dominick Cruz. If Steele sounds like the most optimistic fighter in the world, if he’s not, he’s certainly in the top ten. The reason is simple. When he goes to the gym or fights, it’s truly for the love of the game. 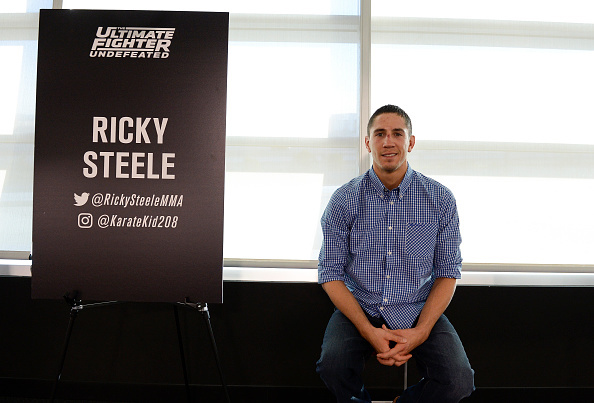 Sure, the prospect of making big money and changing the voice mail on his phone from Steele Paving to Ricky Steele, UFC fighter, is an enticing one, but for now, he’s not doing this because he has to, but because he wants to. And if Steele makes it to the big show, just think of the texts dad will be getting then.